Here you'll see photos and video of my fishing adventures. I'll concentrate mainly on Thailand and freshwater fishing but you might see the odd saltwater post too. I've already been to Thailand a few times and this year will see me spending a lot more time in that beautiful gem of a country. I really love freshwater fishing. In particular I enjoy float fishing. In Thailand most sports fishing is done without using a float...it seems to be more productive. But, I enjoy the finesse of fine float fishing in the same way a fly fisherman tries to outwit his wily prey with some feathers around a hook, or in the same way that the smallmouth bass angler uses an artificial lure successfully. Float fishing can be a bit trickier than bottom ledger fishing. However, that little bright coloured float tip dancing around while the next fish fiddles and teases and considers its options is so much fun to watch. 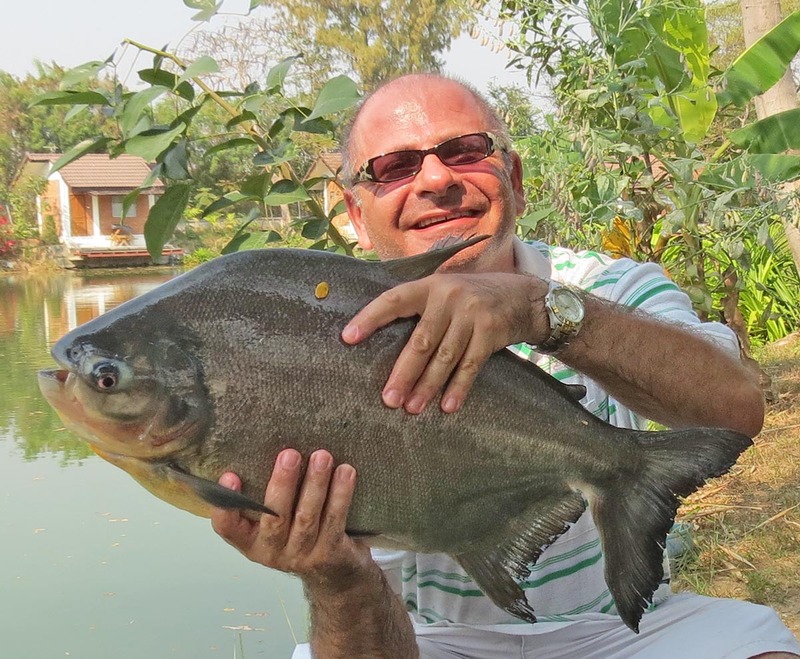 By way of introduction, here I am holding a pacu caught from Dream Lake in Chiang Mai, Northern Thailand. It took about 20 minutes to bring in on light float tackle. The owner's Thai wife really enjoyed telling me "He just a baby Pacu!"